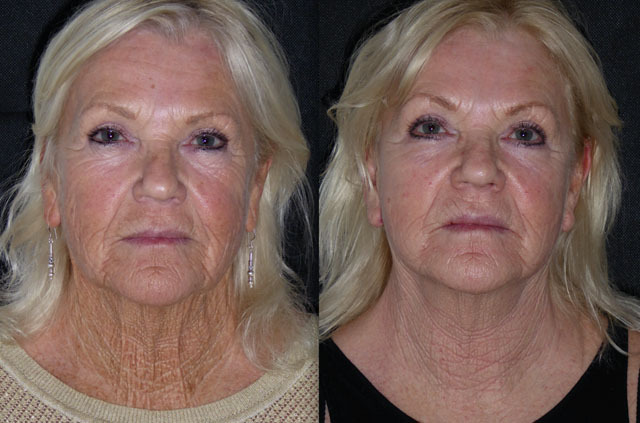 Jacqui was referred to me by colleagues in the industry regarding surgical facial rejuvenation. 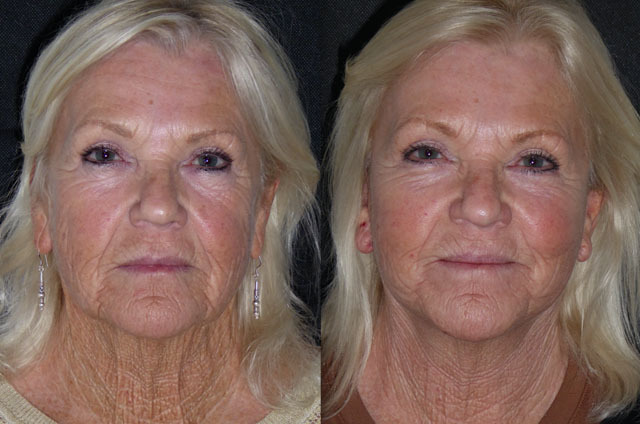 She had nicely delayed the onset of facial aging with non surgical treatments but was looking for help in addressing her lower eyelids, lower face and neck. 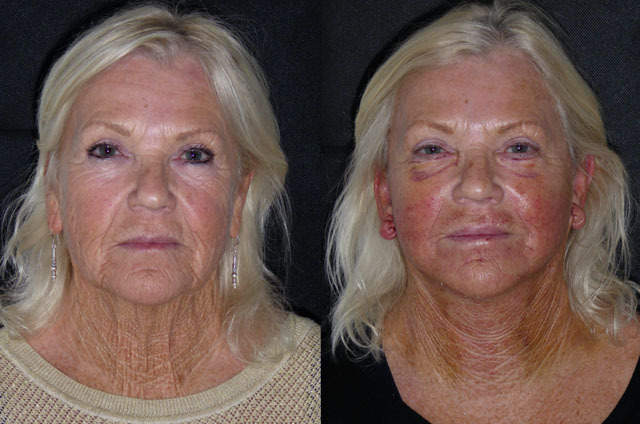 A history of sun bed exposure and previous smoking had taken its toll on her skin and we discussed her options. I suggested a face and neck lift to remove some significant skin excess before we started work on repairing her damaged neck skin. 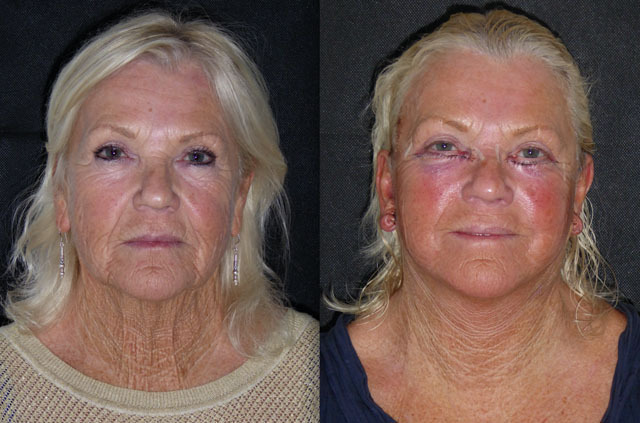 We also undertook a lower lid skin pinch blepharoplasty to freshen her eyes, Jacqui having already undergone upper lid surgery previously. 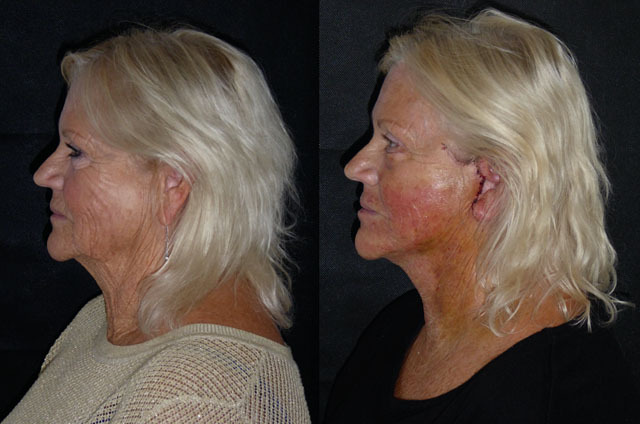 Jacqui did great yesterday, the morning after surgery, her new neck and jawlines are obvious and her skin already looks smoother from excision of the lax skin excess. This smoothness is accentuated by natural swelling which will go down over the first few weeks. On Jacqui’s next review in a week, I plan to start her first stage skin treatment: micro needling to breakdown her hyperkeratinization and encourage new collagen formation. Poor Jacqui! 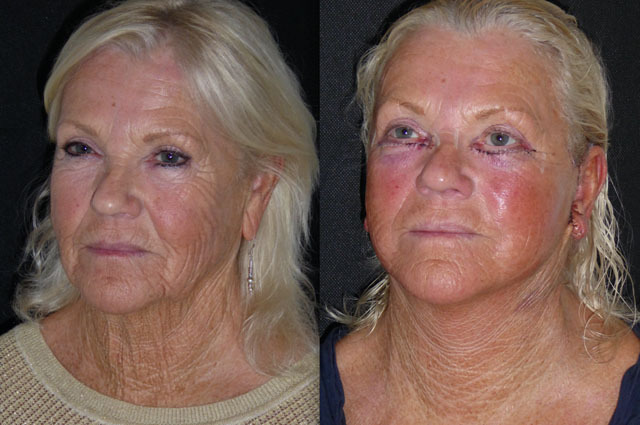 not the best one week photos as Bex has just finished an intense micro needling session on Jacqui’s neck and lower face. Despite the redness and residual bruising from her surgery, Jacqui is starting to look brilliant. Her face more proportionate and defined and her lower eyelid skin excess now gone. Jacqui’s final result will take months but she is well on the way. 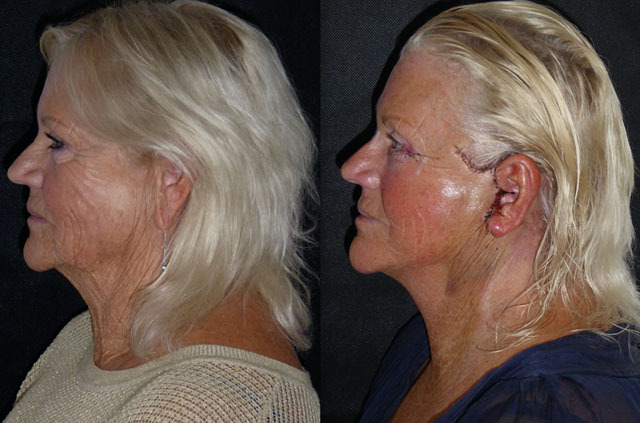 A few weeks later and Jacqui is back for a check up and further session of micro needling. She is making fantastic progress. Her face looks brilliant and is now well healed and her eyes are sparkling now they are appropriately framed. Her neck skin texture to feel has considerably improved which bodes well for her second session today. 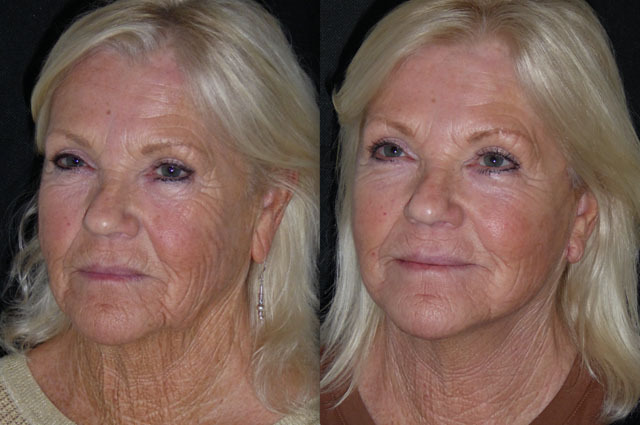 The aim of micro needling is to breakdown the keratinisation of her damaged skin and in one session it feels softer. My plan is to repeat this again before C02 laser resurfacing with an aggressive fractionation protocol. 3 months out Jacqui makes the 12 hour round trip for review. Having been on the train since 4.30am she must be shattered but despite this looks so much better. 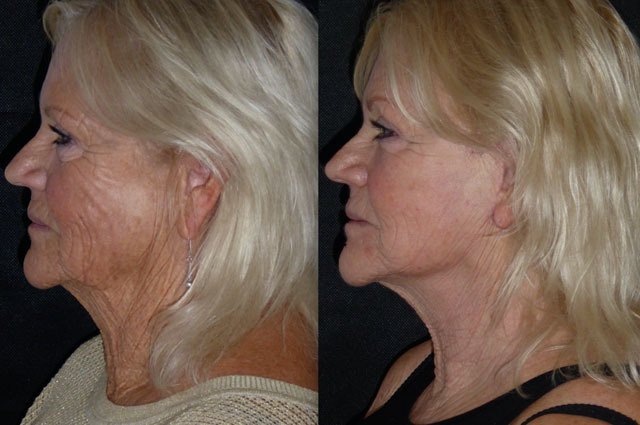 Her lift is holding brilliantly and she has good support in her mid face and a nicely defined jawline once more. Her lower eyelids look great. 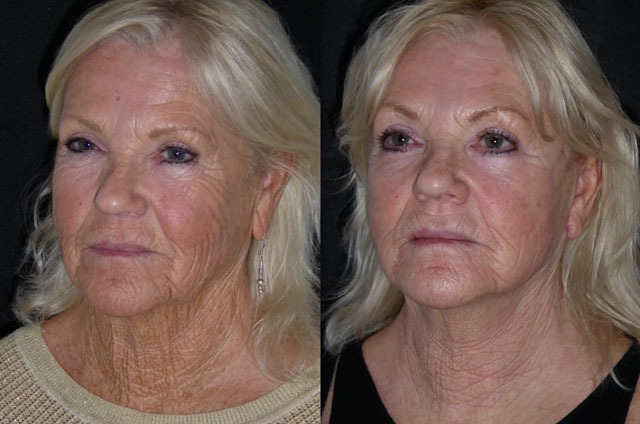 Jacqui has now had 3 sessions of micro needling to her neck and lower face and her skin quality has significantly improved. 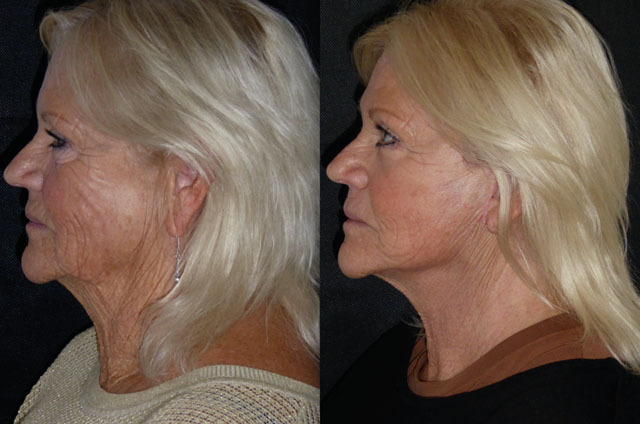 Much healthier, softer to touch, improved pigmentation and vascularity and her vertical pleats have gone. 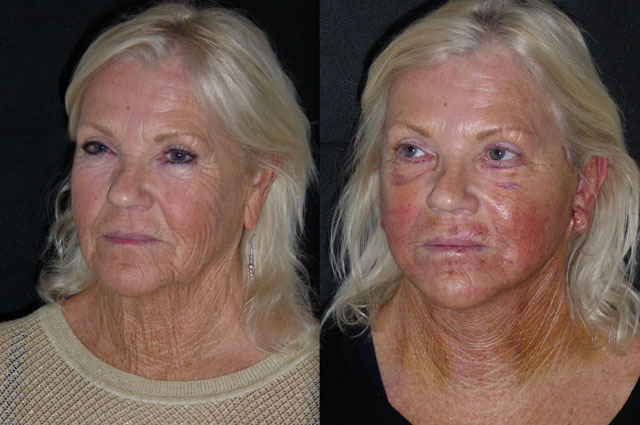 Now the keratinisation has been improved and she has been on Retinol her skin should be ready for CO2 laser resurfacing which we plan to do next month. Jacqui is doing great, she has committed to repairing her sun damaged skin, its a long hard slog and takes time and perseverance but she is being a superstar.